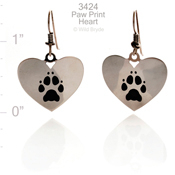 Pets leave paw prints on our hearts and that was the inspiration for our beautiful new Paw Print Heart earrings! The inlaid black epoxy really makes the paw print pop! Featured here in rhodium (silver) plate with sterling silver earwires, this style is also available in gold-plate with 14K gold-filled earwires.